April 7, 2016 By Amber 7 Comments This post may contain affiliate links. Read my disclosure policy here. Ever wonder what to cook especially on those cold, winter nights when nothing really sounds good? Something warm, creamy and delicious is exactly what you will get with this one! 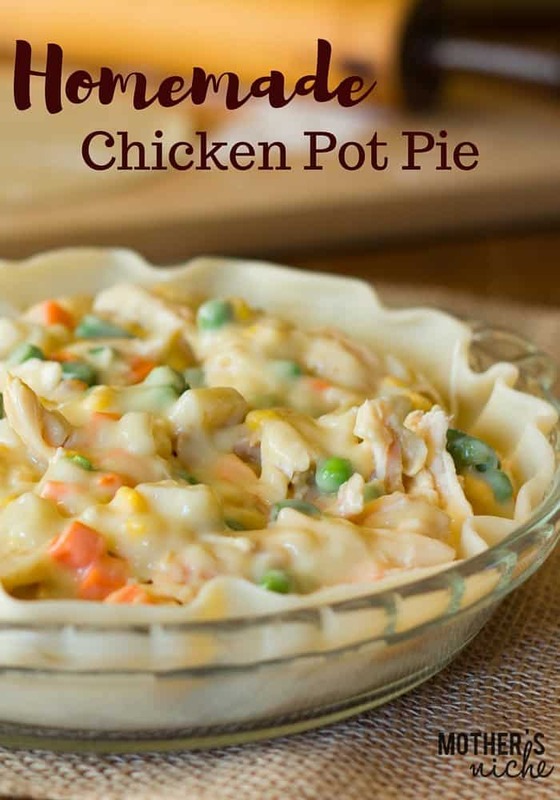 Chicken pot pie, and for the kids that aren’t vegetable lovers, it’s easier to sneak those in to a dish like this, disguised with chicken and a flaky crust! I got this recipe from my college roommate and have yet to find a better pot pie! The crust recipe is also great for dessert pies — prep and freeze a yummy apple pie while your at it! Pre-cook and slice chicken and carrots. Add flour until well-coated, then quickly add chicken broth before the flour mixture starts to burn. Stir until mixture thickens to desired thickness, adding more flour if needed. Add sage, salt and pepper. Add corn, peas, carrots (I pre-cook mine so they are already soft) and cooked, sliced chicken. Mix until well combined and all ingredients are heated through. Place bottom pie crust in a baking dish and pour in the pot pie mixture. Add the top crust and pinch the two crusts together to help keep the pie from boiling over. Wrap in foil and store in the freezer until ready to use. Let pot pie thaw in fridge before cooking. Bake uncovered in preheated oven at 425 degrees for 30-35 minutes or according to crust instructions. 1. Remove plastic wrap or foil before baking. Bake at 475º for 15 minutes, then at 375º for 45 minutes. « Kids Butterfly Garden: Watch Caterpillars Grow to Butterflies From Home! I’d love to try this, but where is the crust recipe? Didn’t see any milk or cream mentioned. Mine tasted great but did not look like your photo. Yours looks more creamy and a little juicier. Mine was not dry but just didn’t have as much juice/gravy whatever you want to call it. Thanks so much.